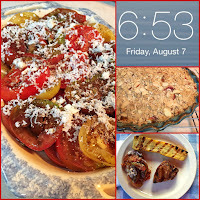 If you can believe it, this is my 301st Weekend Cooking post! I kind of wish I had known last week was 300, because I might have celebrated or something! Anyway, for the first time ever I was at a loss of what to post today. So I did what any normal person would do--I asked Twitter. I got a number of great suggestions (which I'll use in the future) and decided to go with dinner at my house last night. So here we go. I started cooking at 5:33 pm. I had five large peaches left over from the farmers market and thought I should make a peach crisp. OK, so really I wasn't planning on baking, but because I was documenting the meal, I felt compelled (I'm kind of an overachiever). I used my standard recipe, which you'll find by clicking the link. Next, I had some beautiful heirloom tomatoes, a cucumber, and a couple of carrots, which were crying out to be some kind of salad. I ended up using only the tomatoes: I sliced them, drizzled some olive oil and balsamic vinegar on them, sprinkled them with pepper, and then grated some ricotta salada cheese on the top. Yum. And pretty. Finally, we grilled lamb chops and zucchini. I've used a variety of seasonings on lamb chops over the years, and our current favorite is the salt-free Cajun seasoning mix from Penzey's, which I used last night. We grill the chops at about 400F for 6 minutes on the first side and 5 minutes on the second side for a perfect medium rare. I simply sliced the squash in half, brushed it with a vinaigrette, and grilled it exactly like the meat. We were eating dinner on the deck, with a nice glass of red wine before 7:00. We'll dish out the peach crisp a little later in the evening (after I've already written this), and will likely make a pot of coffee to go with it. I kind of wish we had vanilla ice cream in the house, but alas we don't. All in all this was an easy summer dinner that I managed to pull off after a full day of work. Of course, I didn't have time to take a walk last night and I do work from home, but still, I didn't feel rushed or put upon, and the evening on the deck was lovely. It didn't hurt that grilling means cleanup was super easy. If Mr. Linky is gone (there are some issues today), just leave your link in the comments and I'll add it to the linkup when it returns. What a lovely evening! Now that we can finally get some good tomatoes, we love a good caprese salad with dinner. Everything sounds so good, especially the tomatoes! 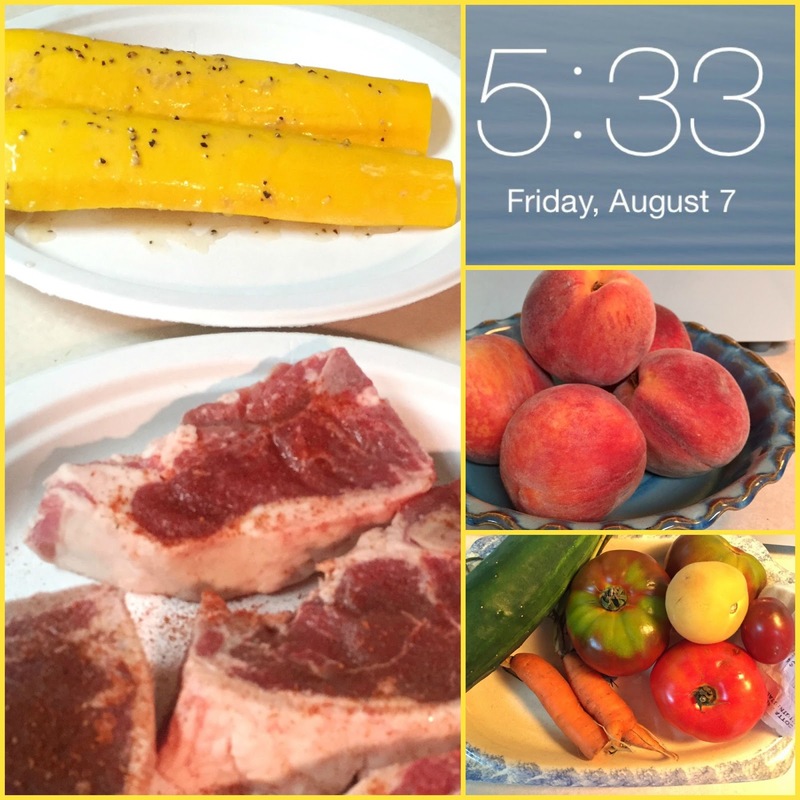 I love this post and all the descriptions of your dinner. A nice invite into your home 😊. 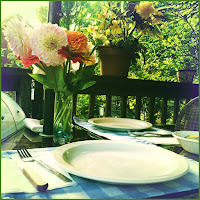 We used to eat most of our meals on the patio but this year has been horribly hot and rainy. I miss it sitting out there. Now you have me wanting lamb chops....expect a post about grilled chops coming up. I love this post idea!! And - there is almost nothing better than a simple heirloom tomato salad when you have the best tomatoes! And - have you ever grilled peaches? I love doing that...and drizzling a little honey and sea salt on them to finish (with vanilla ice cream, of course). Have a great weekend. Sounds like a lovely meal and a lovely evening! I'm not great at being spontaneous with cooking based off what we have so it's great that you pulled off something so perfectly seasonal! Great post idea! A perfect evening! I was in a Penzey's store for the first time a couple weeks ago (in Boulder, CO) and purchased their Cajun seasoning mix... can't wait to try it. Meal sounds yummy&hyoid had time to tweet about your new books.Great night! Sounds delicious! We love fresh heirloom tomatoes but tomato season is almost over here. We did manage to get some from Biltmore Estates last week but they're all gone. Your photos look like the cover of a lovely cookbook!! 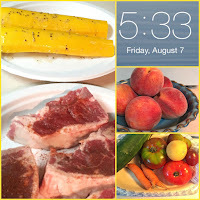 Your dinner sounds perfect tomatoes and lamb YUM!! I always forget about grilling zucchini! Do you marinate it/brush it with a vinaigrette, or...? Dinner outdoors on the deck - one of my favorite parts of summer. I need to do that more often. Summer is made for outdoor eating. The best. 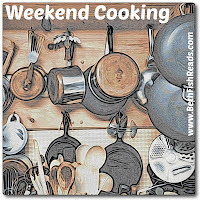 Congratulations on Weekend Cooking post #301! I love this post! We had a lovely summer meal the other night courtesy of my husband, who wowed me by trying a vegetarian dish (link below). This "flatbread" (really more like naan) requires a bit of prep, but not too much actual cooking so it's good for hot summer evenings. He skipped the sumac (too hard to find) but it was so flavorful even without it. We decided if we made it again, we'd chop the tomatoes instead of slicing them because it would be easier to eat, but otherwise it was a recipe we'd definitely do again. What a fun post and lovely looking dinner! Sounds like a lovely summer dinner! You and I sound a lot alike (I think we already knew that) - working with the fresh produce in the house and keeping things simple :) We also have big piles of both tomatoes and local peaches on our counter right now! And my family loves grilled zucchini. Enjoy your summer bounty this week! Beautiful photos, and yes, you are an overachiever! 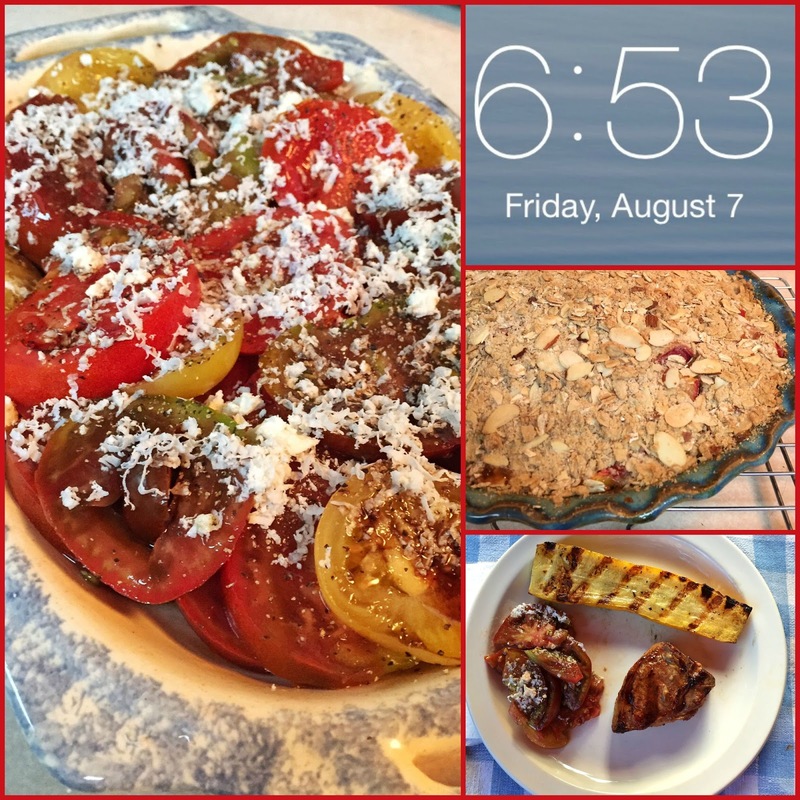 I'm constantly in awe of you, and 301 consecutive Weekend Cooking posts is amazing! (I finally managed to get another one done today, after letting several weeks go by without.) I love grilled zucchini! We have lots of herbs from the garden now, but the zucchini and green beans got attacked by beetles or something and they're dying off early. Waiting for our peaches, but we got to pick some from our neighbor's trees a while ago, which was nice! 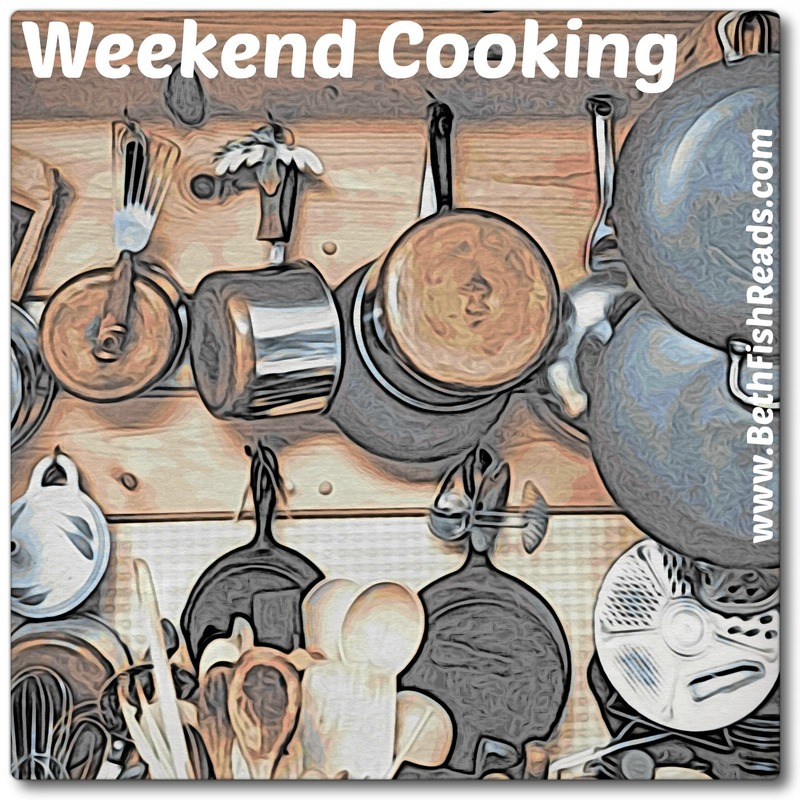 Congrats on so many Weekend Cooking posts! It sounds like you've been at this for a while. ;) Your dinner sounds absolutely delicious! I'm not eating meat these days, but dang do I miss a good lamb chop. And give me any baked good with peaches in it. Have you ever made a peach custard pie? I made some delectable cookies this week, and I linked up above. Grilling in the summer is my favorite thing... so delicious and so easy to clean up. My coworkers have starting bringing in extra produce, so I've got some delicious tomatoes to use up soon. Oh I loved to hear how your dinner prep went. Sounds so good. I've never made lamb chops before but it is one of my favourite things to eat!